Every doctor you see tells you that that staying physically active is one of the most important keys to staying healthy as you age. You probably get around rather well for your age, but you may have a few limitations that keep stressful, physical activity more of an impossibility rather than a daily goal. Because of this, you do what you can to keep moving, but know you should be doing more. So, when you’re over 50, what exercises can you do to stay physically fit when treadmills, rollerblades, and gym memberships seem out of the question? Stretch yourself beyond your comfort zone and see lasting results in your health. Remaining healthy and independent as you age is important. As the old saying goes, “You’re only as old as you feel.” For you, you might feel pretty old! But, taking control of your health may be easier than you may think. Paying close attention to your diet and nutrition is one simple way to add some life to your years. As always, for your health and safety, be sure to consult with your physician or a professional dietary nutritionist about any changes to your diet before you make them. These medical concerns can certainly keep you from living the full, active life you desire. But, taking a yoga class designed for seniors is one simple way to put a little more vitality and life back into your years. The physical poses and stretches that are a part of the practice, combined with relaxation and breathing techniques, have been shown to alleviate many of the symptoms to these conditions, and may actually improve your health in the long run. Yoga’s various breathing and meditation techniques that you’ll learn have been connected to reducing anxiety, improving poor sleep patterns, calming moods, and improving lung problems. The various stretches and poses that are taught in yoga are connected to improving muscle strength and flexibility. This can reduce back pain and alleviate some symptoms of arthritis. Getting started is as easy as locating an area yoga class created specifically for the 50+ crowd. Check with your local senior center, YMCA, or any nearby yoga studio to learn which class is right for you. Don’t push yourself to do more than you can handle. 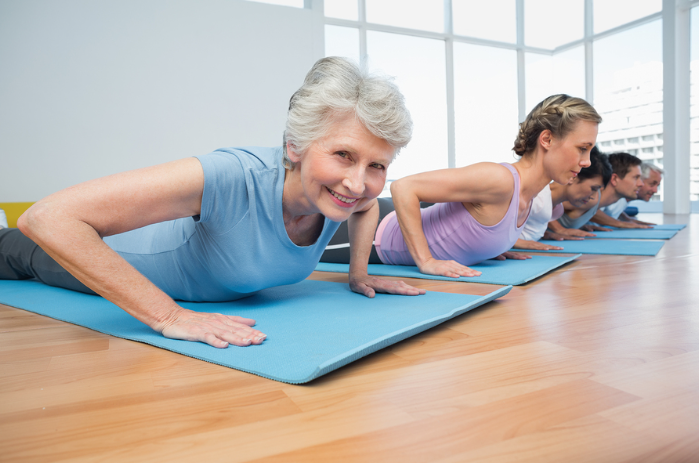 Find a yoga teacher that understands the physical limitations associated with ageing. If you’re looking for a new avenue for introducing physical activity to your daily routine, yoga might be the perfect option for you. After consulting with your physician, get signed up for a class right away. It’s not too late to start, and the benefits may come faster than you can imagine. Take a Yoga class and get on your way to a healthier, happier, you. Beth Wallace is a Safety Specialist for Canadian Safe Step Walk-In Tub Co. She visits seniors at their homes and shows them how they can make their homes safer. Her goal is to make sure they have a better quality of life and to see that their wishes to stay in the home they love for the rest of their lives are granted. Safe-Step Walk In Tub Company is committed to empowering North America’s senior citizens, as well as those individually suffering from the effects of disability and mobility impairment. For those who seek a therapeutic, high-quality bathing experience, we offer domestically produced walk-in bathtubs and walk-in showers tailored to their specific needs.